I made these caramel apples as a party favor for my step daughter's baby shower. I made 24. It took about 2 1/2 hours from the first unwrapped caramel to the dressed up favor. 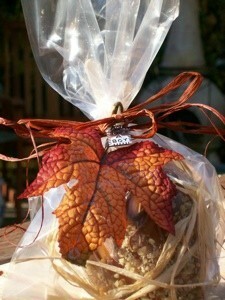 These would be also nice for a fall themed bridal shower or wedding favor. Source: My step daughter's idea for her favors! What a great idea! Caramel apples are my very favorite treat. Very attractive. Your step-daughter is a lucky lady.